Are you one of those people who maintain a range of WordPress websites and constantly switch from one theme to another? If so, you should know that testing your website in different browsers, under different mobile devices, operating systems, and screen sizes is very important. In this article, we introduce you to why browser testing is important and which tools you can use for testing purposes. Although most people use Google Chrome, other browsers such as Microsoft Edge, Firefox, Opera, and Safari also enjoy a large market share and are widely used. Because of the wide range of devices, browsers and operating systems, testing a website in different browsers have become an indispensable part of creating a new website. Testing your new website or a WordPress theme across a range of browsers ensures a more consistent web experience for your visitors. The majority of web browsers behave in a similar manner when they display web content. However, they do render certain elements differently now and then as they use different codes to achieve the same result. BrowserStack comes with a limited free trial account, allowing you to test their services for 30 minutes. You can use it for both websites and mobile applications. It allows you to select both the browser and the platform you wish to test. Simply copy the URL you want to test and BrowserStack will load a virtual emulator within the browser window. The speed is very good and the results are accurate and satisfying. 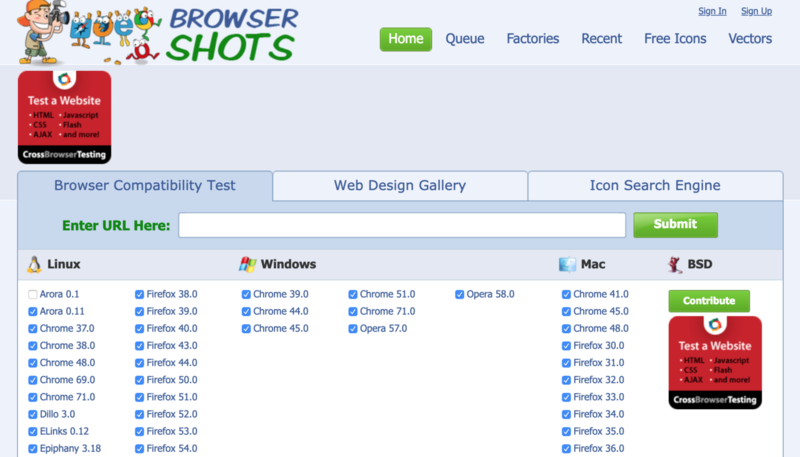 CrossBrowserTesting is a very popular, powerful and easy-to-use tool. Although it is a paid service, they offer a 100-minute free trial account to test the product. Use their “Live Test” tab after creating your account with them to load a website URL under the operating system and browser you selected. Its “Screenshot” feature allows you to grab multiple screenshots on different operating systems and browsers at once. What also comes in handy is that it mentions the differences between layouts under each screenshot taken. You can then decide whether to compare the layouts on the screen immediately or download them to your computer for later analysis. Contrary to BrowserStack, CrossBrowserTesting doesn’t run live tests. It relies on screenshots, which could be problematic if you want to know whether your website works the way you expect it to. This cross-browser testing tool is an open source, which also means that it is free, making it the best option for many people. The downside is that it doesn’t cover mobile devices testing and testing under Internet Explorer and Microsoft Edge. The tool is even simpler to use. Just copy your website’s URL in the appropriate field and then choose the browsers you’re interested in. You will need to wait awhile after submitting your requests as the tool performs a series of tests and generates screenshots. Now that you have decided which tool works best for you, it is time to analyze the results of your screenshots. If the WordPress theme you are using is of good quality and responsive, the screenshots must look almost identical. Should you encounter sufficient differences that adversely affect aesthetics, user experience or even functionality, you may wish to consider a different theme. Otherwise, simply ignore it. Ollie Mercer has been a fan of all things tech for as long as he can remember. He has now turned his passion into a living. He keeps a close watch on the developments in the tech world and shares them with all his readers. When he isn’t working, he can be found playing his favorite video games. The post Test Your WordPress Website Easily in a Range of Browsers appeared first on Torque.